Gently rounded or capped by tall peaks, mountains are the planet’s most striking showpieces. They are also Earth’s highest land features. Many of these massive, often steep formations are located along the edges of continents. They may form chains, or ranges, that extend for thousands of miles (or kilometers). The principal mountain ranges include the Rocky Mountains and the Andes, which run from North America all the way down through South America, the Atlas Mountains in Africa, the Himalayas in Asia, and the Alps in Europe. The longest mountain range in the world is at the bottom of the ocean! It measures more than 40,000 miles (65,000 km) long and reaches several miles (or kilometers) high. As solid and imposing as these mountains may appear, they are far from being immobile. Throughout their existence, mountains rise, change shape, and wear down. Earth’s history is marked by three great periods when mountains were formed. The first occurred more than 400 million years ago. Some mountain ranges in the eastern part of North America are remnants of that period. The second period was around 300 million years ago, when the Appalachian Mountains and some of the massifs of Europe and central Asia were formed. All these mountains are classified as ancient. They are distinguished by their gentle slopes, which have been made round by erosion. 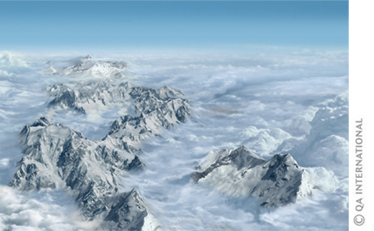 The last period occurred barely 50 million years ago, when the Alps and the Himalayas were formed. These young mountains are marked by their irregular, jagged peaks. Since the process of erosion is slower than the mountains’ growth rate, the peaks slowly continue to rise. Mountain ranges form in a process called orogenesis, where two tectonic plates meet. Tectonic plates are the huge puzzle pieces that form Earth’s crust. On continents, there are two main types of mountain ranges. One type is formed where an oceanic plate meets a continental plate. The second is formed by the collision of two continental plates. When an oceanic plate meets a continent, the oceanic plate slides underneath the continent. Rocks and sediment are pushed along and deposited on the edge of the continental plate, creating new land features. 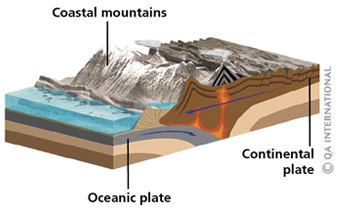 As the oceanic plate sinks lower, sediment and rocks build up and may form coastal mountains. A good example of this kind of process, which is called subduction, is the Andes mountain range in South America. 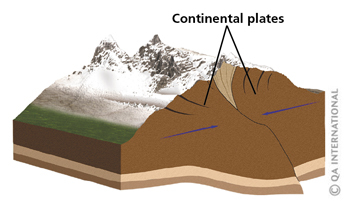 Some mountain ranges are created by the collision of two continental plates. The Himalayas, for example, were formed when India and Asia crashed together. The force of the collision folded Earth’s crust and pushed it upward, creating a new mountain range.